I guess it’s time to catch up on my long delayed (ok, less than a week still) Thanksgiving post. My family came to my house for the meal because I had the most space–a real dining room, the largest kitchen of them all–and because, frankly, I wanted to control the side dishes. My mother did threaten at one point to throw butter in the beans and mashed potatoes…thanks mom. Mind you, my family isn’t huge by any sense of the imagination. The guests were my mother, my brother and his wife, and two of my friends who wanted to have a bigger dinner than one or two dishes shared between themselves. We had quite a spread, and I would have taken more pictures but I was tired of being ridiculed, so I don’t have more. My mother brought the turkey for her and my brother and his wife (somehow a 12 pound whole turkey was cheaper than a turkey breast…I bet they’re still eating turkey today, actually), stuffing (vegan and non) and a pumpkin pie. Josh and Amy brought Quorn Chickn reubens (which I did eat, swiss cheese and all–yes, I’m a bad bad vegan) and a bean and nut salad. I provided the rolls, carmelized onions and green beans, garlic mashed potatoes, millet pumpkin casserole, and a shmlove pie. 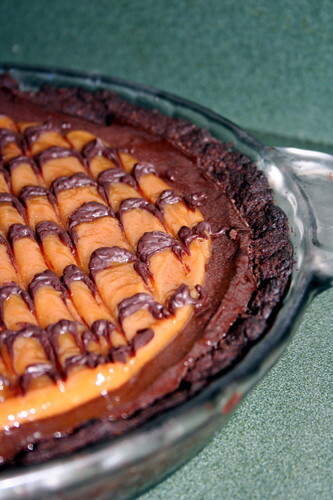 I’m not going to give you the Shmlove Pie recipe–go buy Veganomicon for that. It’s worth the whole book. I’ve made it twice and it gets better every time. Seriously, go buy the book, even if you love meat and can’t abide the thought of cooking vegan food. It’s seriously the only recipe source I’m using right now and I couldn’t possibly be happier with any other book. But here’s the recipe for my take on Mark Bittman’s Autumn Millet Bake Recipe which I found on Heidi’s site, 101 Cookbooks. Forgive the photo. The lighting in my dining room was horrid and I had to take the picture without any styling. Put 2 tablespoons of the oil in a small skillet over medium-high heat. When hot, add the millet and cook, stirring frequently, until fragrant and golden, about 3 minutes (hs note: don’t overdo it). Spread in the bottom of the prepared baking dish. Scatter the pumpkin cubes and the cranberries on top of the millet. Sprinkle with salt and pepper and the sage and drizzle with syrup. Carefully pour the warmed stock over all (cp note: I did about 1 cup stock & 1/2 cup soy milk ). Cover tightly with foil and bake without disturbing, for 45 minutes. Carefully uncover and turn the oven to 400F. As discreetly as possible, sneak a taste and adjust the seasoning. If it looks too dry, add a spoonful or two of water or stock. (hs note: This is key! The millet should be close to being cooked through at this point, if not you need to add liquid and keep it moist and cooking ). 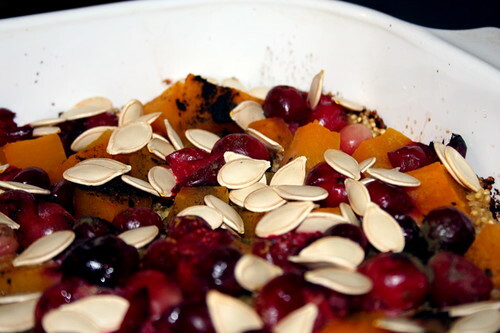 Sprinkle the pumpkin seeds on top, and return the dish to the oven. Bake until the mixture bubbles and the top is browned (hs note: and the millet is cooked through), another 10 minutes or so. Serve piping hot or at room temperature. Sounds like your Thanksgiving turned out to be a lovely event!! I want to make the Shmlove Pie from Veganomicon so badly, but the long lists of ingredients and instructions intimidate me so much!! It looks so delectable though – yum! And speaking of yum, that word pretty much sums up that Autumn Millet Bake – I remember seeing the recipe on the 101 Cookbooks blog.